Chowbacca! : My Brew Got A Beat Down From Stumptown, Bro. My Brew Got A Beat Down From Stumptown, Bro. 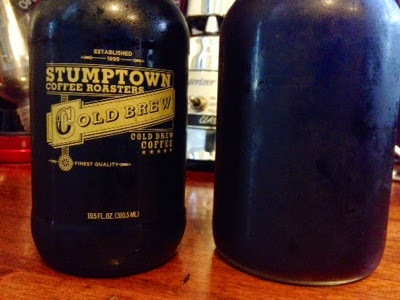 "Shake hands and come out fi ... oh, wait ..."
I saw Stumptown's cold brew in the cooler at Marbella the other day and having heard the hype I had to try a bottle. While I enjoy my home-cold-brewed French press favorite, and, even more so, the local coffee spot's iced rocket fuel ... well, I had to try it, and I did try it. The results may click bait you. I hate to admit defeat, but I'm admitting defeat. Unlike my French press cold brew, Stumptown's brew is ridiculously clean-tasting, closer to a coffee-infused water than a cup of coffee. They've lowered the acidity profoundly. If only I could make it at home, oh, wait, they tell you how here, and will gladly sell you their Filtron home cold brewer here. Hm. Fifty-bucks for a plastic bucket and a vase. Five bucks a bottle for their pre-made brew. While Stumptown does offer a less-expensive option I've used for years, and I'm not opposed to spending on worthwhile coffee equipment, I'm just not as committed to coffee as I used to be and I have storage problems with having large amounts of bulk iced coffee or toddy. The French press cold brew trick? 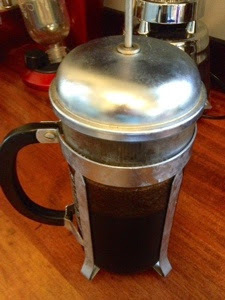 I put eight scoops (I like it strong) of my favorite coffee (Ethiopian) into my 8 cup French press and fill with cold water. I let it sit, not plunged, in the fridge for 24 hours. I plunge and enjoy. It's good, but it needs some work. So, from Stumptown's showing it looks like my resolve to improve the flavor of my small batch home brew with no more than a minimal cost increase has been re-awakened. I'll let you know what I come up with here.